Jesse Reiter, leading Detroit, Michigan birth injury attorney and partner at Reiter & Walsh ABC Law Centers, is a member of the prestigious Million Dollar Advocates Forum. Established in 1993, the Million Dollar Advocates Forum is a diverse group of US trial lawyers composed of members who have proven to be highly skilled, experienced, and knowledgeable in the largest and most complicated cases. Membership in the highly respected Million Dollar Advocates Forum is reserved only for those attorneys who have won million and multi-million dollar verdicts and settlements. Fewer than 1% of lawyers in the United States are members of the Million Dollar Advocates Forum, and currently the forum includes around 4,000 members. The membership comprises many of the top trial lawyers in the United States of America. Their practice areas include, but are not limited to, product liability, personal injury, medical malpractice, construction, environmental law, employment, and business and insurance litigation. All members have demonstrated exceptional results in complex cases. Certification by the Million Dollar Advocates Forum not only recognizes outstanding achievement but also provides members with a national network of resources for professional assistance, information exchange and professional referral. Because birth injury cases tend to be drawn out, high-stakes, and both legally and medically complex, it is critical to choose a birth injury lawyer who can provide proof of his or her experience winning big birth injury and medical malpractice cases. Jesse Reiter’s membership in the Million Dollar Advocates forum indicates his successes in the field of birth trauma litigation. 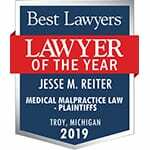 Unlike other attorneys in Michigan and the United States, Jesse Reiter is both highly decorated and specifically focuses on taking birth injury cases. His specific and extensive knowledge and experience is, without a doubt, unique in the legal field. If your loved one was diagnosed with a permanent birth injury or disability as the result of medical malpractice, the Detroit, Michigan birth injury attorneys at Reiter & Walsh ABC Law Centers can help. Our legal team encourages you to reach out for a free case review today. You may call our offices toll-free at 888-419-2229, complete this online contact form, or press the Live Chat tab to the left of your browser screen.